Energy is the driving force behind life. It allows for plants to grow, animals to hunt, and children to play. Humans have a unique relationship with energy, unlikely any other creature on the plant; we have the ability to harvest energy using technology. This allows the human race to grow and prosper more rapidly and effectively. However, human history would reveal a reckless past as we have exploited the Earth’s resources. It was once acceptable to cut down a tree without worry that entire forest would disappear from the land. It was once acceptable to drive a muscle car that only got ten miles to the gallon without even having a single thought of carbon emissions. Times have changed, and it is more important than ever for the world and its communities to become conscious of our energy use. The idea would be to develop into a world that can sustain itself, and what better way to start than the sustainable use of the force behind life, energy. 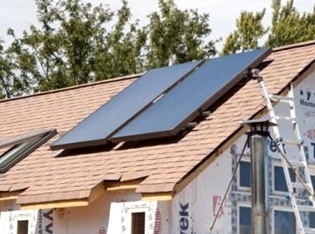 A residential solar heating panel for water (Harnetech.com). It would be a monumental task to provide a sustainable energy solution to every community in the world. Instead, we will explore the possibilities for the city of Schaumburg, Illinois. The journey you are about to take will begin with a brief discussion about nuclear energy, followed by an examination of of alternative renewable energy resources that include geothermal, wind, and solar power. We are in the state we are now because of the ever-popular yet clearly unsustainable energy source of fossil fuels. Finally, we suggest that the most important factor in creating an energy-sustaining community is people, and how we can reduce our energy consumption to benefit all. The overall goal is to drive our suburbs and cities toward cleaner and more sustainable energy sources. Banner image: Rooftop solar panels are a key source of clean energy (source: Greenmi.net).